With Speedify for Teams, you get lightning-fast channel bonding and rock-solid redundancy for all of the people and devices in your organization. Other benefits include a centralized management interface (the Teams Dashboard) and individual customization options. Additionally, Teams users also have access to API keys and the opportunity to purchase Dedicated Speed Servers. For organizations that need to stream video from devices in the field, it's a huge step up in quality and reliability. Users of Speedify for Teams will get the same great Speedify experience and will benefit from our innovative channel bonding technology wherever they are around the world--whether they are using Android, iOS, Windows or macOS. Bonding: Speedify lets your team bond internet connections together to get the combined speed of all of them. Use 3 different LTE modems on different carriers to send rock-solid video streams from anywhere. Put together DSL and LTE to get decent connectivity to even the most remote office. Reliability: Speedify's bonding also makes your internet more reliable. If a connection fails, it simply moves the sockets to another connection. Your apps never know there was a problem. In the optional Redundant Mode, Speedify will send each of your data packets over two of your connections, so that even if a connection suddenly drops, you don't lose a packet! The ultimate in reliability for mission critical VoIP. Security: Speedify isn't just about speed; it's also a secure VPN. Everything you do through Speedify is encrypted via lightning-fast standards-based DTLS encryption. Speedify for Teams offers many configuration options to support your scenarios. Whether you are trying to bring better mobile connectivity to mobile devices and workers, stream professional video more reliably, or bond slow DSL and/or LTE connections for better internet in a satellite office, Speedify for Teams is your solution. Centralized Account Management: One web console where you can control your user accounts, manage billing, and view server statistics. 100% Uptime Guarantee: Our Service Level Agreement (SLA): 100% uptime guarantee, 1 day of free service per hour down. Simply submit a SLA request with the time of the outage, and we will grant you your credit. Password Manager Integration: On iOS, Speedify is integrated with all the major password managers, including 1Password, LastPass, Keeper and Dashlane. Users can login with a single click. Virtual Dedicated Speed Servers: We create and manage dedicated Speedify servers in the cloud for your organization. Important for professionals who need a guaranteed service-level agreement. Port forwarding and Static IP addresses: When combined with a Dedicated Speed Server, you can run internet accessible services on your computers which access the internet through a Speedify bonded connection. Integrate Speedify with Your App: We offer APIs and command lines on every operating system to let your apps talk to Speedify. 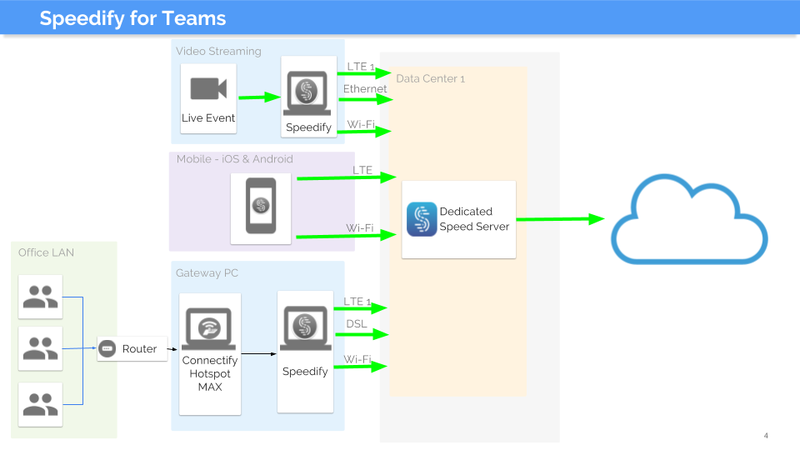 Your video streaming app can make sure Speedify is connected to your private server before it starts. Alternatively, your VoIP app can push Speedify to redundant mode so important calls aren't dropped. Click here to purchase a Speedify for Teams plan.